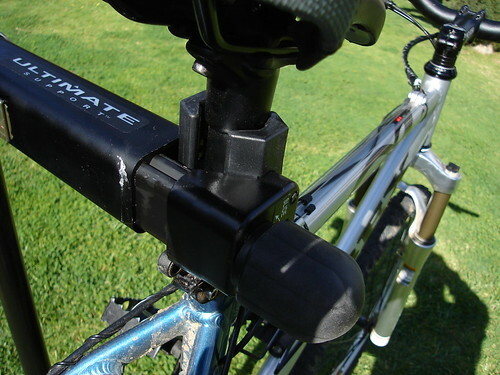 Our newest Partner, Ultimate Support sent us the Pro Compact Repair Stand to review. I took some shots of it to give you a tease. I mounted the Ibex Trophy on it to show you folks how its done. 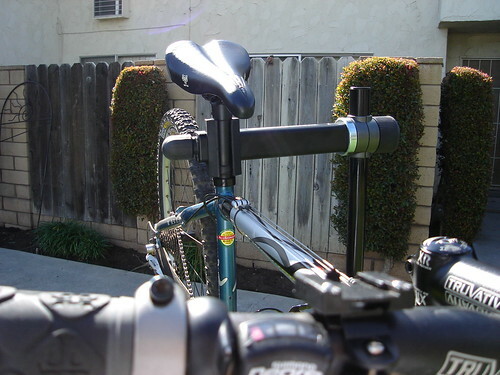 Award-winning Pro-Stand clamp with quarter-turn action, quickly clamps without crimping or marring seat posts and tubes. Fits in tight places and on different tube diameters..
Folds compactly for travel or storage. Folded size is small enought to fit in travel cases and the smallest trunks. Easy set-up/tear down with no tools required. Ratcheting,quick-releases quickly set-up and tear- down. Sets up from 38” to 58”. 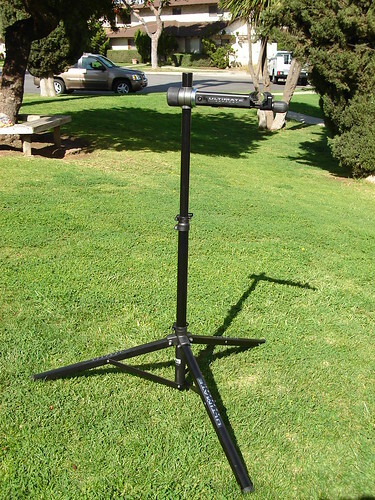 Tripod configuration holds up to 60 lbs. on uneven surfaces (i.e. dirt, grass, slopes etc.). Large rubber footcaps enhance grip on all surfaces and won’t fall off. Stay tuned for the review, but in the mean time, check out Ultimate Support. That looks pretty cool. I’m interested on what kind of review you guys would give it. Looking forward to it.